If you haven’t entered Riding Warehouse’s Horseware giveaway yet (here it is on facebook, or here on Insta), you should. 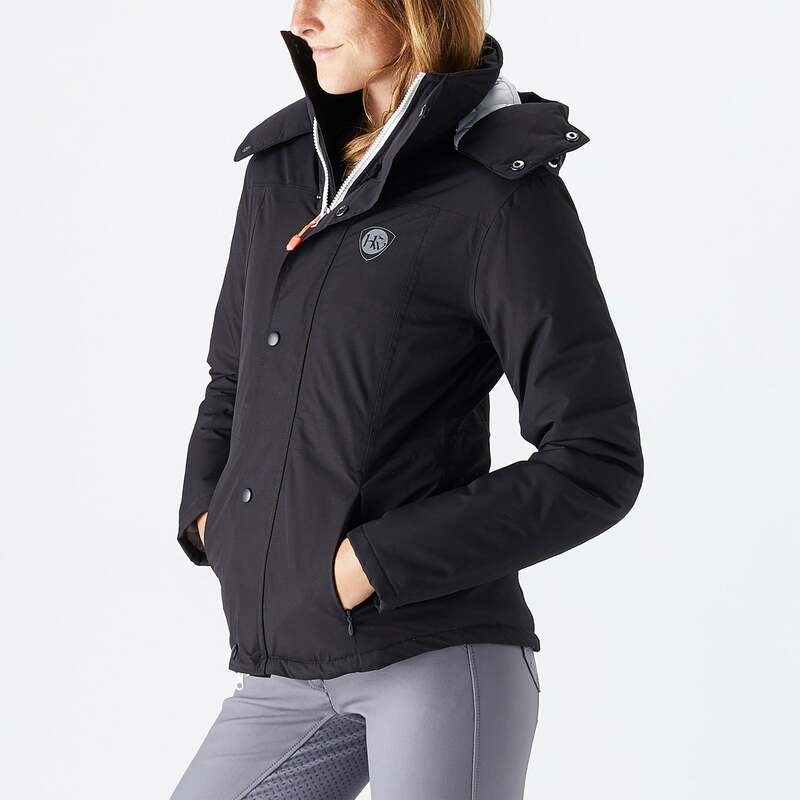 It’s a great giveaway, and it includes the item that I’ve basically been living in for the past couple weeks: the waterproof Brianna jacket. I was able to snag an emerald green one, but RW carries the admittedly much more versatile black version, as well as last year’s turquoise version in XS and XL in their sale section. At first glance I wasn’t sure how much use I would get out of a jacket like this here in Texas. It’s got a decent amount of fill (do you use the same terms for human jackets as you do for horse blankets? I’d compare it to a midweight turnout blanket.) with a warm quilted lining on the inside, and a waterproof exterior. But since Texas has been completely drunk since the middle of September, I’ve actually already worn it quite a bit. The cut and fit of this jacket are perfect for riding – it’s just the right length so that you aren’t sitting on it, and it’s slim enough to not be bulky. But for me, my favorite feature is the hood. First, it’s fully removeable, which is a MUST for me in a riding jacket. It’s also got a little brim built into the front, providing more shade if it’s sunny, or more protection from the elements if it’s raining or snowing. The hood is nice and big, so you can retreat pretty far into that thing to shield your face, or you can even (maybe, depending on how big your noggin is) pull it over your helmet. It also has a flap around the front that can snap to cover your lower face, if necessary, as well as elastic toggle pulls to adjust the fit around your face. There’s also a hidden elastic drawstring inside at the waist, if you want to adjust the fit, AND there are 4 pockets – 2 inside and 2 outside. And since everything is waterproof, you don’t have to worry about putting your phone or your course map in there. I also appreciate that the front zipper is 2-way, and has a placket that you can snap over the top if it’s windy or raining. 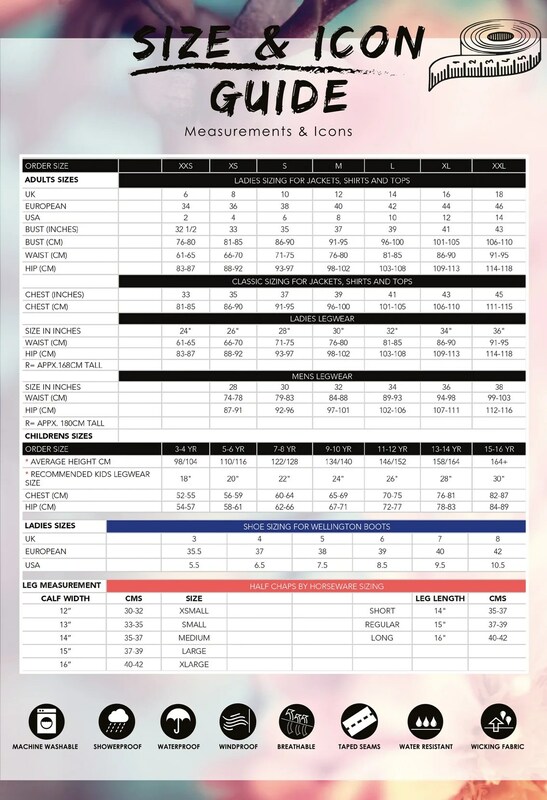 As far as sizing, I find Horseware’s stuff to be pretty true to their size charts. I have a 36″ bust and wear the medium jacket. My only real complaint with this jacket is that I think the zippers on the outside pockets could be bigger, with larger pull tabs. It looks very sleek with it’s current small, semi-hidden ones, but they can be a little hard to grab and zip/unzip when you’re wearing thick winter gloves (like when I was scribing last weekend, wearing some legit mittens). Overall though, this jacket is a really well-designed (that hood, it is love) and versatile piece of clothing for a rider. I like having a waterproof coat that’s still attractive, and a warm coat that isn’t bulky. Definitely a solid purchase, IMO, especially with a 20% code (which I pretty much always have, if you ask!) or at the very least, a really legitimate reason to enter Riding Warehouse’s giveaway. We can’t escape the inevitable… winter is coming! Been waiting to see which one you got. I can’t believe not only you got a coat in a color you want but have actually used it in TX!! Crazy weather. It is still raining here since yesterday. I may need water wings on Remus tomorrow to get around dressage UGH. I have a few things in my RW cart so I need to go look at this jacket!! Glad you like it. I have a lot of heavy down coats and light fleece coats i want something in the middle. My one jacket i got last year I still love but again it is not exactly what i want or may need here in TN (ha ha ha I thought i would be wearing shorts all winter…fool me)! Glad to hear it’s awesome because earlier in the week I seem to have ordered it from Amazon in that pretty green color. And the matching softshell jacket… and the fleece half zip… and fluffy jacket. Shut up. Oh wow, I LOVE a good jacket! The hood with visor thing – sign me up! What do I have to do to get the 20% off code? Click the link to the jacket in the post to access their site and then use code RWRN at checkout!